From anywhere north of Seattle to southwestern British Columbia, the most prominent peak on the skyline is Mt. Baker. Around Bellingham, you will find many places and things named in it's honour: Bakerview Road, Mt. Baker Highway and the Mt. Baker Theatre to name a few. While we can see Mt. Baker right from our condo, the views from the air in our airplane 997 are the best. Mt. Baker is one of the 27 major volcanoes in the Cascade Range. The largest eruption was 6,600 years ago. In 1843 there was a smaller eruption, and in 1975 plumes of steam rose from the same crater. It is still an active, but dormant, volcano and continuing studies are conducted through our local Western Washington University. Mt. Baker is a well known ski and winter sports destination in the Pacific Northwest. A short drive into the hills from Bellingham will take you to a winter wonderland. The Mt. Baker Ski area offer excellent skiing at very reasonable prices. All day adult lift tickets for the 2008-09 season are $35,75 mid-week and weekends and holidays are $43.17. If needed, they have rental equipment as well. Want to make it a mini-vacation? Information about lodging in the area can be found at the Mt. Baker Ski Area website and the Mt. Baker Lodging website. You can also stay in Bellingham and drive up to the ski area. It is about 30 miles east, but due to road conditions in winter I would say it takes hour or so to get there. I have a suggestion for a place to eat on the way to or from the ski area. 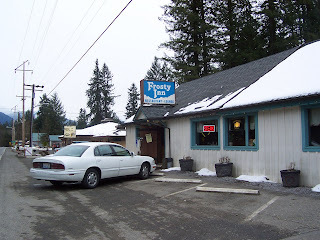 It's called the Frosty Inn in a small commuinity called Maple Falls. They have great breakfasts. We haven't been there in the evenings, but they also have live entertainment on weekends, especially during ski season. Today dawned sunny and warm, so Wayne and I decided to put the fair weather to good use and get 997 in the air. We've been talking about flying to Orcas Island for quite some time. 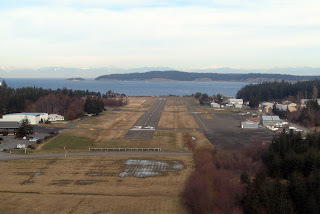 From our home base at Bellingham International Airport, Orcas is only a few minutes and air miles away. It's one of the larger San Juan Islands that lie between the Washington mainland and the southern tip of Vancouver Island. 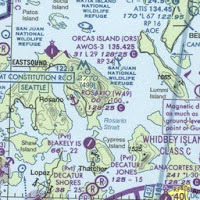 Orcas Island Airport (KORS) is situated on the narrow isthmus in the center of U-shaped Orcas Island. Runway 16/34 is 2900 feet long and 60 feet wide. The elevation is just slightly above sea level at 31 feet. Both ends of the runway have clear approaches. There's ample parking for transient aircraft on the asphalt or in the grass. Look for the blue cones by the terminal and in the southeast corner near the approach end to runway 34. Today it was practically empty, but I'm sure summer can get pretty crowded. Eastsound, the town center on Orcas Island, is only one mile away. Exit the airport and follow the "Public Path" signs to get there. It's an easy walk through forested areas, open fields and village streets. In Eastsound you will find shops, stores and restaurants. We stopped at The Sunflower Cafe in the center of town. They serve breakfast and lunch with fresh organic ingredients. On occasion, an industrious mouse will find his way into our cabin. Wayne and I hate to kill anything, but when a mouse moves into our living space, we have to do something. Before we knew better, we used poison and kill traps. Then we discovered there are live traps even for mice. That's a good thing, because now we've discovered a mouse's nest tucked away in the dish cupboard of our Bayliner. 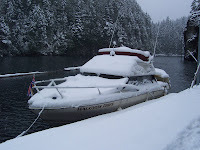 The Bayliner is our ocean boat, and we keep it docked at the cabin all winter. We don't know for sure how he/she/they entered, but they must be evicted quickly before a ship takeover occurs. The first trap we purchased was pretty expensive. It was made by Havahart and was designed to capture one mouse at a time. It has been a successful model for us, especially when it's baited with chunky peanut butter. Cortes Island at the northern end of the Strait of Georgia is a nautical paradise. Last summer Wayne and I took an overnight cruise to several marinas on the south side of the island. Our first stop was in Gorge Harbour. This was an overnight stop with our friends Ken and Sam from Gibsons. 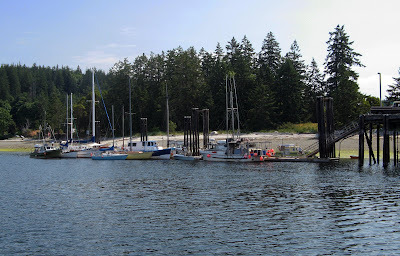 The Gorge Harbour Marina is a popular moorage for locals and visitors alike. East of Gorge Harbour is Manson's Landing. There are only a few spaces at the Government Dock so most boats anchor out. The bay is open to southwest winds and swells, but on a nice day it makes a good spot for a day hook. You can hike about a mile to the village with its restaurant and store, swim in the fresh waters of Hague Lake or bask on the sandy beaches of Manson Landing Provincial Park. Next head south then northeast to Cortes Bay. In addition to the Government Dock there are outstations for the Seattle and Royal Vancouver Yacht Clubs. If there aren't any spots at the Government Dock and you aren't a yacht club member, anchoring out in well protected Cortes Bay makes a good overnight stop. If you have a bicycle aboard you can ride the island's roads. They are a little hilly, but even for a pedal wimp like me you can get to lots of destinations. To reach Texada Island or cross the Strait of Georgia to Vancouver Island from Powell River, you have to take a ferry. Sunset arrivals make a beautiful picture. One year ago today was a very happy day. It was the day Wayne and I became Canadian permanent residents. As far back as I can remember, I've been coming to Canada on vacations. Both of my parents were educators and summer camping trips often included crossing the border. I have many fond memories of those trips, camping in our tent in the woods and hanging out under the campground pavilion on rainy days. Wayne and I continued the tradition. Most summers we would pack up our Piper Arrow 997 and head north to explore and camp throughout Canada. 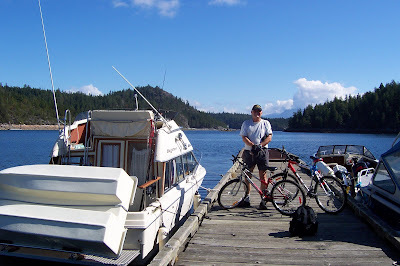 Then we discovered Powell River in 2000 and our floating cabin in 2001. This is a picture taken on our first day at the cabin. We camped on the deck while we waited for the deal to be final. Three straight nights of rain drove us indoors and we haven't wanted to leave since. Today I met my good friend Betty (better known as Mud Creek Mama) for coffee and shopping in Historic Fairhaven, just south of downtown Bellingham. There are lots of great restaurants, shops, book stores and, in the summer months, the farmer's market. Today our destination was the Eclipse Bookstore at 1104 11th Street (360-647-8165). The Eclipse Bookstore has an amazing amount and variety of books covering the two floors of the establishment. Because it's a used book store, the prices are very reasonable. It takes tiptoes to see the volumes on the top shelves, but the easiest way to get to the bottom of things is to pull up a piece of carpet and settle yourself down on the floor. Woman in the Bush by Jeanne Connolly Harbottle and Fern Grice Credeur about a young bride's journey into the Yukon wilderness in the 1940s. 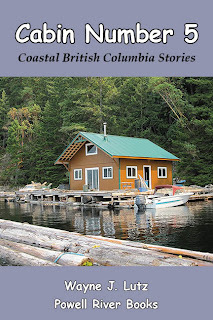 Bright's Crossing by Anne Cameron (a Powell Riverite) which is a collection of Coastal BC short stories told through the eyes of eleven women. To fortify ourselves before wandering the shelves, we stopped across the street at Avenue Bread (1135 11th Street). In addition to their wonderful fresh breads (I chose the seed covered baguette - YUM), they have a small cafe. We could have chosen soup, salad or sandwiches to go with our coffee, but opted for some of the fresh baked treats. I got the cinnamon twist. It was so crisp and flaky (double YUM). One of the easiest ways to get to and from Powell River, BC, is by air. If you have your own airplane, you can fly into the Powell River Airport (CYPW). For most of us, the best choice is Pacific Coastal Airlines. 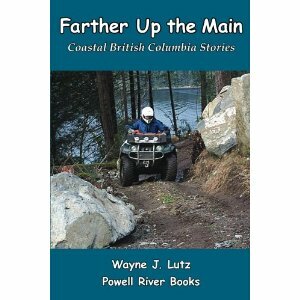 Pacific Coastal had its origins in Powell River. Powell Air Ltd. flew Convairs out of Vancouver and Powell River and float planes from the government dock on Powell Lake. In 1979 they merged with the Port Hardy division of AirBC creating Pacific Coastal Airlines. 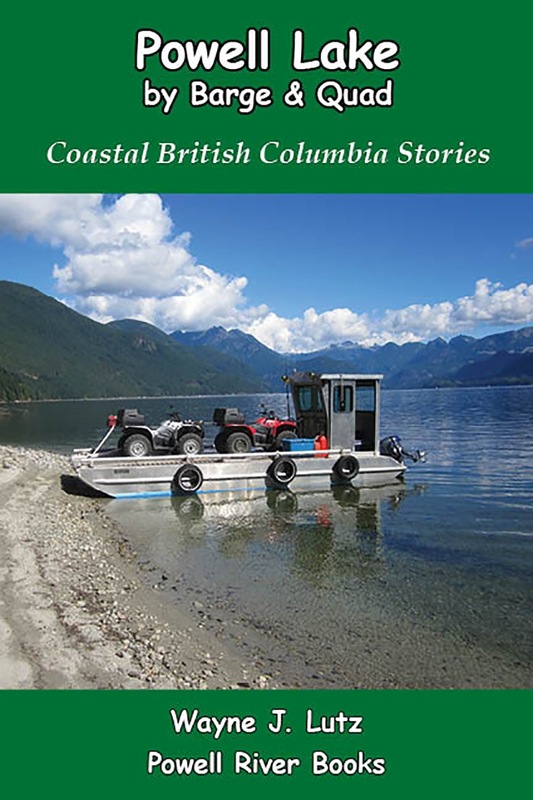 From these humble beginnings, Pacific Coastal now serves fifteen cities in BC from two hubs, Vancouver's South Terminal and Port Hardy. Pacific Coastal's fleet of planes is matched with the destinations they serve. 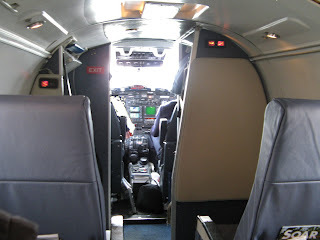 They include the Saab 340 and the Shorts 360 (both 30+ passenger turboprops), the Beechcraft 1900 (a 19 passenger turboprop), the Beechcraft Super King Air (an 11 passenger twin), and the Grumman Goose and the de Havilland Beaver (floatplanes). In addition to their scheduled runs they also provide customized charter services. I catch Pacific Coastal at Vancouver International Airport's South Terminal. If you are arriving at the main terminal, they provide a courtesy shuttle service. Pick-up points include Pillar 2 on the international arrival level and outside doorway "F" on the domestic arrivals level. I have a tradition when I arrive at the South Terminal. I stop at the Skyway Cafe for a Kokanee and a bite to eat while I wait for my plane. This counter restaurant provides excellent salads, sandwiches and my favourite, wonton soup. It's just the thing to tide me over before having dinner when I arrive in Powell River. Pacific Coastal has a new discount program for frequent fliers called Quick Pass. Benefits for placing $2,500 on account include: discount price, late booking with no extra cost, cancellation or change with no extra cost, online booking, share with family and friends. This really works out well for Wayne and I. 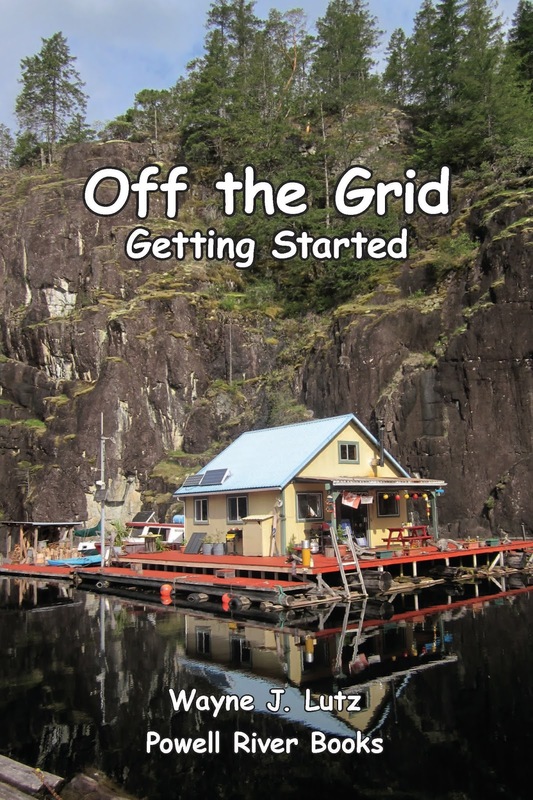 In Powell River, BC, there's a famous group of men who give freely of themselves for the hiking community. They're called the BOMB Squad, short for Bloody Old Men's Brigade. 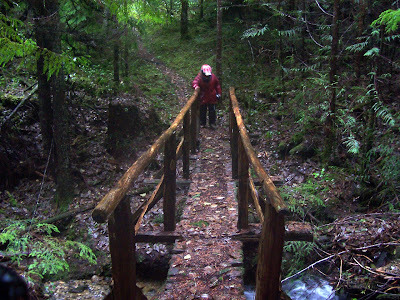 Throughout the backcountry you will find countless trails, boardwalks and bridges they have constructed. According to their website, the squad began in 1987 with three retirees working to clear some of the older trails around Powell River. The group soon grew to seven men all in their sixties and seventies. As of last year, the number has increased to twenty-seven and the age range up to eighty. Thanks to consistent Thursday work day efforts, they have over 180 kilometres of trails and 60 structures to their credit. So if you go hiking in and around my town of Powell River, you will find lots of evidence of their handywork. Valley fog forms on clear winter days when heavy cold air settles into the mountain valleys while warmer air moves over the surrounding mountains. Fog forms when the frigid ground cools the air immediately above it. The cooling air thickens into fog as water condenses. Air farther from the Earth’s surface is warmed by the sun, trapping the layer of cold air beneath it. The condition is called a temperature inversion, and it can last several days. When the fog begins to clear it typically moves from north to south down the lake. 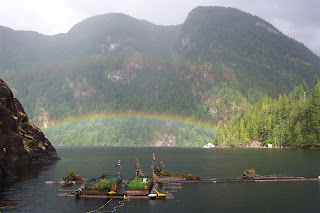 From the deck of our float cabin we can often see it flowing back through First Narrows.